After taking a fairly thorough beating in the morning fourball matches – going down 3-1, the Europeans demolished the U.S. team in the afternoon foursome session, taking all four points, to go up 5-3. 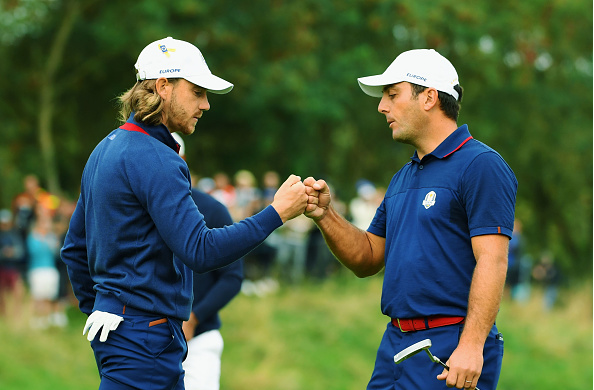 Led by the red-hot duo of Francesco Molinari and Tommy Fleetwood – who beat Tiger Woods and Patrick Reed, 4 & 2, in the morning, and Justin Thomas and Jordan Spieth, 5 & 3, in the afternoon, the Europeans won all four foursome matches for the first time in Ryder Cup history. The afternoon’s first foursome match pit American veterans Dustin Johnson and Rickie Fowler against a similarly experienced duo in Henrik Stenson and Justin Rose. After four-straight halves, the Europeans captured the next three holes to turn with a 3-0 lead. Additional birdies on Nos. 10 and 11 gave Stenson-Rose a commanding 5-0 lead. The Americans shaved a couple of points off the lead after winning hole Nos. 12 and 13, but following three-straight halves on Nos. 14-16, the Europeans were declared winners, 3 & 2. 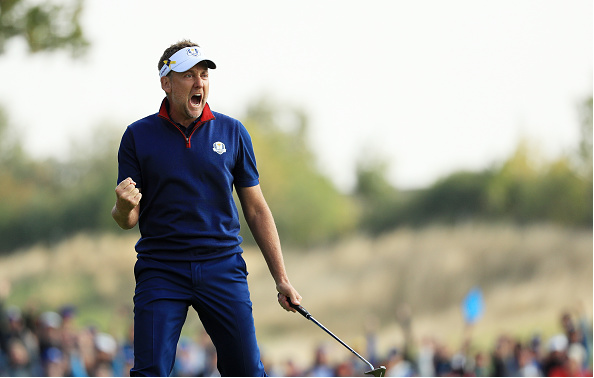 In the sessions’ second match, Ian Poulter and Rory McIlroy came back from 2-down deficit to defeat Bubba Watson and Webb Simpson, 4 & 2. “We just needed to put our heads together and go out there and just hit good golf shots. Foursomes on a day like this is very, very tough format to play. Just try to get the ball in the fairway and get the ball on the green and for the most part today, we did that,” said McIlroy. Simpson and Watson got off to a hot start with hole-wins on Nos. 1 and 3 to go 2-up, but the Europeans came back roaring, winning hole Nos. 6, 7, 8 and 9 to go 2-up. A birdie on No. 11 by the Americans made it a one-point match, but the Europeans took the next two holes to extend lead by three, eventually closing it out on the 16th to win 3 &2. In the third match, Americans Phil Mickelson and Bryson DeChambeau had no chemistry, and were blown out by Spaniard Sergio Garica and Swede Alex Noren. The Americans lost holes early and often, making the turn down seven holes, en route to a 5 & 4 defeat. 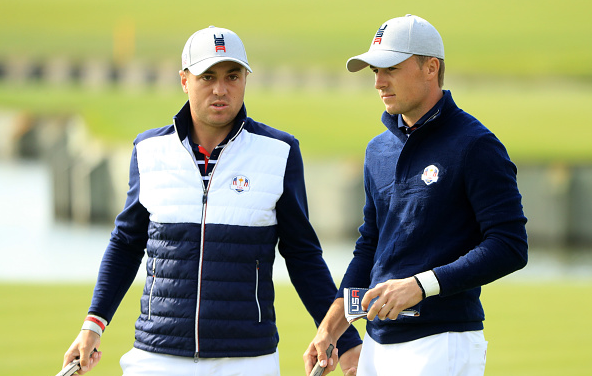 Finally, the anchor match had young American superstars, Jordan Spieth and Justin Thomas, squaring off against Italy’s Francesco Molinari and England’s Tommy Fleetwood. 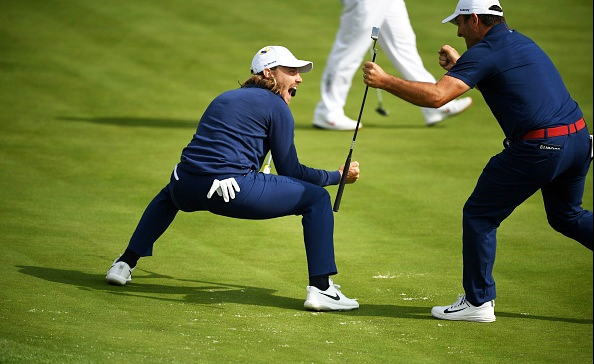 The surprisingly stout duo of Fleetwood and Molinari won hole Nos. 3, 5, and 6 to quickly go 3-up. A hole-win by the Americans on No. 8 was offset by a dropped hole on No. 9, giving the Europeans a 4-up lead at the turn. The Europeans extended their advantage, taking hole Nos. 10, 13, and 14 to close the match out, 5 & 4. “It’s great, but we need to put the hat back on for tomorrow and reset quickly,” said Molinari. “They are going to come out strongly tomorrow, so there’s no time to celebrate when there’s still a job to be done.